Looking for some new games for your centers! 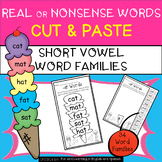 This package contains two nonsense or real word games for primary grades. Just print, laminate and enjoy! 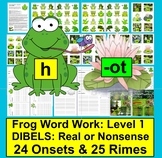 Frog Word Work: Phonics Fun Set 1 - Onset Rime DIBELS Real or Nonsense! The students read words that contain soft c and soft g sound. After decoding the word, they sort into categories by real words and nonsense words. This packet also contains a second version that requires students to add one more word of their own to each category. The students read words that contain the variant vowel all. After decoding the word, they sort into categories by real words and nonsense words. This packet also contains a second version that requires students to add one more word of their own to each category. 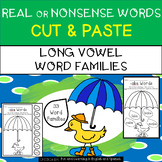 CVC real and nonsense words. Spin each spinner to make a word. Read the word and decide if it is a real word or a nonsense word. Write the word on the correct paw. Two sets of spinners. This is a great review activity for Dibels Testing. 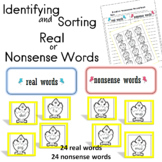 Can be used in small groups or individually for an intervention activity.Students will read each shell word then place on the Real Words "sand bucket" or Nonsense Word Card "sandcastle". 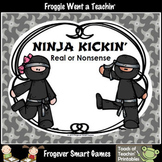 Nonsense Words--Ninja Kickin' Real or Nonsense?